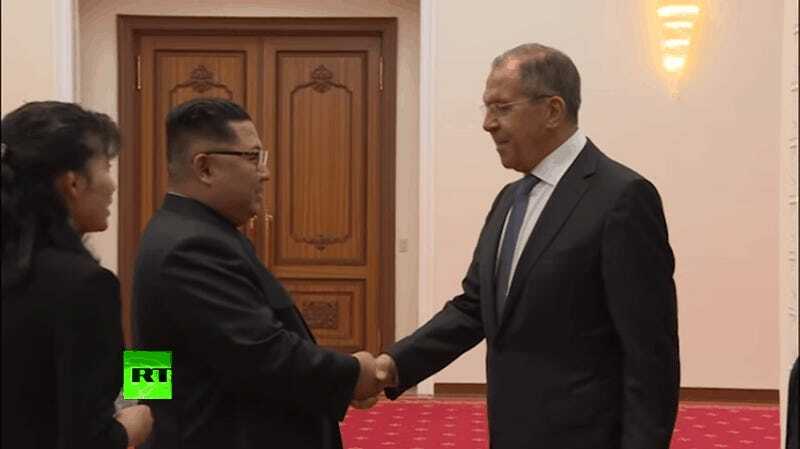 Russia-1 aired a segment yesterday about Russian Foreign Minister Sergey Lavrov’s recent meeting with North Korean dictator Kim Jong Un. But one part of the news broadcast was pretty weird. Take a look at Kim’s face in the screenshot on the left. Kim has been photoshopped to look like he’s smiling. And it’s not even a very good photoshop job. 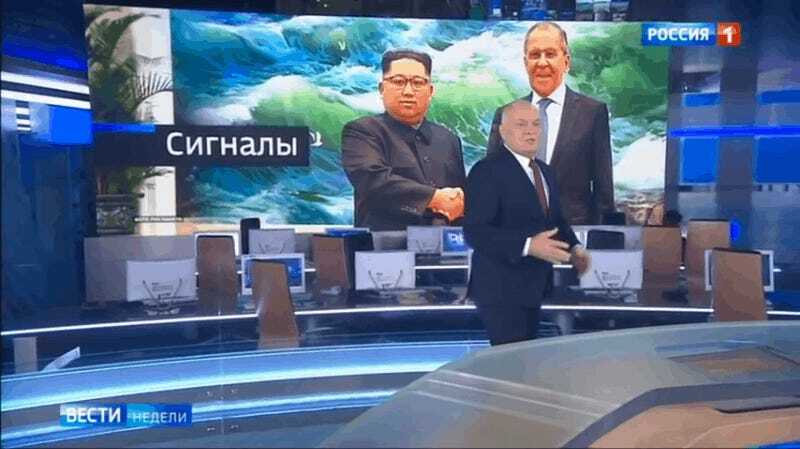 The strange photoshopped image aired on “News of the Week” with Dmitry Kiselyov on Russia-1, a popular TV news channel that’s backed by the Kremlin. First spotted by Fake_MIDRF, a pro-Ukraine Twitter account that spots fakes in Russian media, you can really see the difference in the photo posted to Twitter by Russia’s Foreign Ministry, and the photo that was played on Russian TV, which is available on YouTube. 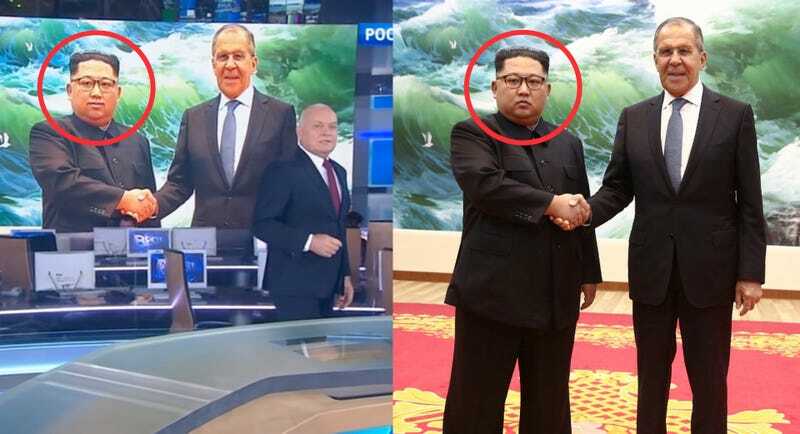 It’s unclear why Russia-1 would bother photoshopping the image, since they also aired plenty of positive footage showing Lavrov’s meeting in North Korea. 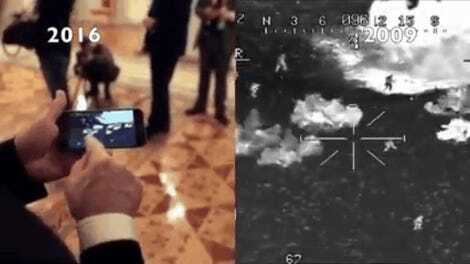 But this isn’t the first time that Kremlin media has aired fake news footage. Channel One (also Kremlin-backed) was ridiculed back in February for running video game footage during a news segment about the war in Syria. President Trump is scheduled to meet with Kim Jong Un in Singapore on June 12th, and old alliances die hard. North Korea wants to be recognized as a real player on the world stage, and they’re getting precisely that. But countries like Russia and China don’t want North Korea to get too cozy with the U.S., not that there’s much likelihood of that anytime soon. You can watch a short clip of yesterday’s show here. Russia wants it citizens to believe that countries like North Korea, an old friend from the Soviet-era days, would never abandon it to strike an alliance with western global powers—even if state-run media have to photoshop an awkward smile on Kim’s face to do it. But in the end it simply makes Russian media look less trustworthy when they’re caught manipulating photos. Long story short? Everything’s bad and nothing matters anymore, least of all the concept of objective truth. Update: 11:18am: The host of the program, Dmitry Kiselyov, just gave an interview to the Govorit Moskva radio station and denied that his show manipulated the photo of Kim in any way. “They always photograph at high shutter speed. So you get various phases of facial expressions,” Kiselyov said, trying to explain why the photo might look so weird. But all you need to do is look at the video from their photo-op last week. Yes, Kim was smiling at some point, but Kim is obviously not smiling when the head-on photo is taken. Lying to the end, even in the face of overwhelming contradictory evidence, really does seem to be in fashion these days. Perhaps America and Russia will indeed come together over shared values under President Trump and President Putin. Correction: This post originally misstated the TV network as Channel One, rather than Russia-1. Both are Kremlin-backed, but this show appeared on Russia-1. Gizmodo regrets the error. Trump Defends His Tweet of Fake ISIS Video: "All I Know Is What&apos;s On The Internet"